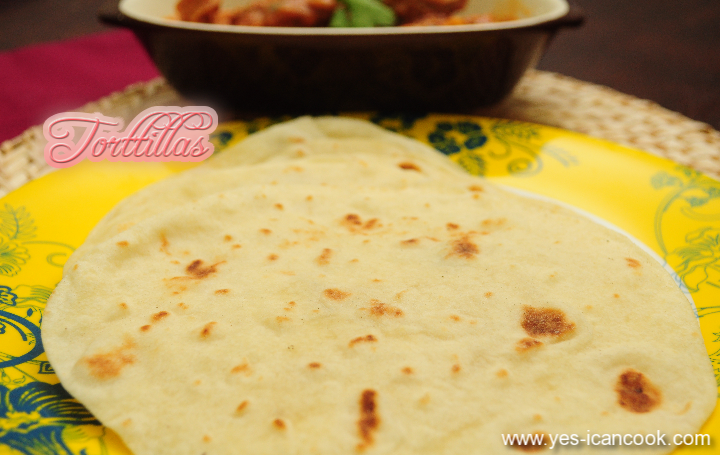 A tortilla is a thin flat bread which was originally prepared using treated maize flour but these days tortillas are made using wheat flour and all purpose flour too. Tortillas are a staple in Mexican cuisine. They are very similar to the Indian Chapattis or Phulkas. 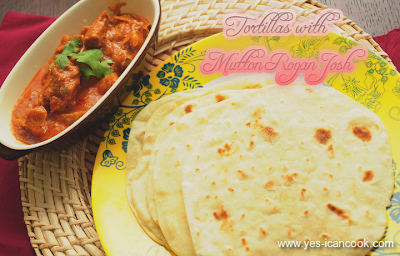 There are several recipes for tortillas with the difference only being in the ratio of the ingredients. I came across this recipe of tortilla on a facebook page that I have recently started following. I gave it a try and loved the texture and softness of the tortillas. 1. In a mixing bowl sieve all purpose flour, salt and baking powder. Mix well to combine. 2. Add the melted butter or oil if using and combine to get a crumbly texture. 3. Start adding warm water little by little and knead to a soft dough. 4. Knead for 8 more minutes, cover and keep the dough aside for about 45 minutes - 1 hour. 5. Knead the dough again for a minute. 7. Take one portion of the dough and roll it into a ball. If the dough does not roll in to a ball easily then use damp hands. Remember not to roll with wet hands, dry your hands so that they are just damp. 8. Dust some all purpose flour and roll the dough into a thin disc. 9. Heat a tawa or a girdle and place the prepared tortilla on the tawa. 10. Reduce the flame to medium. 11. When bubbles begin to form on the tortilla flip it to the other side and cook. 12. Keep flipping and cooking till the tortilla is cooked on both sides with brown spots. 13. Prepare tortillas in the same way with the remaining dough. Stack the tortillas on top of one another. 14. Tortillas can be made in a big batch and can be stored in the refrigerator for a few days wrapped in aluminium foil or stored in an air tight container. To serve simply warm in the microwave or cook for a few seconds on the tawa. 1. If the tawa gets too hot sprinkle some water to cool it down instantly. Recipe adapted from the facebook page Rimzy's Kitchen. These look really good! Who doesn't love a homemade tortilla! Great page you have! Once you have had a homemade tortilla, you just don't want them any other way! My recipe is similar except I don't use baking powder in mine. Thanks for posting your comment Shelby. So true, who will not love a homemade tortilla?